A bishop of the Evangelical Lutheran Church in Tanzania (ELCT) has urged men to build biogas plants which give clean and "instant fire" in order to free themselves from depending on their wives to cook food all the time. 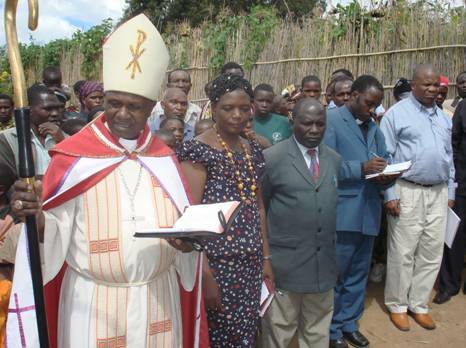 Bishop Job Mbwillo the leader of the ELCT South Western Diocese made the remark recently when he was inaugurating one out of the 200 biogas plants to be built by the ELCT this year in Makete District in the Southern Highlands of Tanzania. The Church works hand-in-hand with the Government in carrying out a-five year project on installing domestic biogas plants. Bishop Job Mbwilo inaugurating a biogas plant at Onesmo and Nisamehe Sanga's homestead in May. Looking on from his left is Patricia Mwaikenda, ELCT Dairy Cattle and Biogas Progamme Coordinator and the Ward Executive Secretary for Matamba, Mr. Benedict Mwegeni. ©2010 ELCT image. 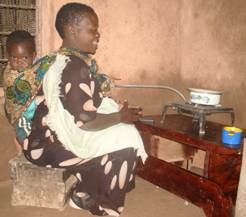 Many households in Tanzania face daily problems to secure their energy needs. The supply of fuels such as wood, agricultural waste and charcoal for cooking are dwindling and becoming expensive while commercial fuels such as petroleum or natural gas are often too expensive or inaccessible. Electricity is only available to between 10 and 15 percent of the population in the urban areas of Tanzania. The Bishop said on May 9 this year: "Biogas plants should now bring to an end the haphazard tree felling activities for firewood in the project area." He said "the face of the earth is now destroyed through deforestation as well as other destructive activities that leave behind gullies and gorges in mining areas like the case of Tanzania." In Kinyika village in Makete District, Mr. Nisamehe Sanga, on whose site the project in South Western Diocese was inaugurated by the bishop, said that she would no longer travel far into the forest in search of firewood or look for people to chop wood for her. 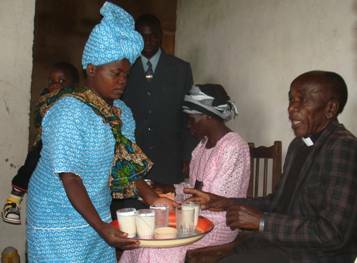 Mrs. Nisamehe Sanga serving hot milk to those who witnessed the inauguration of her biogas plant. ©2010 ELCT image. The idea of the joint biogas project is to provide cleaner and safe cooking facilities for at least 12,000 households in Tanzania by 2013. Ultimately the beneficiary families will have improved health, new jobs will be created for masons and artisans and workload, especially for women will be reduced, the ELCT Dairy Cattle and Biogas project coordinator Ms Patricia Mwaikenda explained. She mentioned benefits of the project to include provision of low cost energy for cooking and lighting. She said lighting will enhance education for children who can now study at night. Biogas will provide clean smokeless fuel thus reducing pollution in the environment and avoiding respiratory and eye disease inherent in traditional cooking and lighting methods. Other benefits are lessening of time used by women in food preparation as they no longer have to travel far into the forest sometimes spending two hours in search of firewood. The environment will be conserved as the cutting down of trees for fire wood will be reduced. Youth who were jobless are now getting training and employment constructing biogas digesters or learning piping in their area. Bio-slurry is another output from a biogas digester as it is the best manure compared to cow dung or expensive fertilizers. Biogas also helps to improve sanitation in rural setting as the cow dung is no longer stored but fed into the digester. It also helps to reduce land degradation as the cow kept for zero grazing conditions reduce overgrazing. Onesta said with biogas at hand life in the village is easier unlike what most youth who believe that better life is in the urban areas. He said cattle-keeping has turned his life around because he was always in financial difficulties but now he is self employed through selling milk. He has been able to build a permanent house and connected water supply to his homestead from income accrued from livestock activities in Kinyika village. Very soon he said he would put finishing touches to his modern house. He said without the cows he would not have been able to get a biogas plant for lighting and cooking at his home. A girl who was interviewed after the inauguration ceremony said "biogas is beneficial for us women, who used to make long treks in search of firewood in the forests hence destroying the environment." "And so this is how our neighbor lives" seems to be the message from those who attended the inauguration ceremony at Onesmo Sanga's home in Makete. He no longer lives in a mud house and now he has biogas for lighting and cooking. ©2010 ELCT image. A young woman who was at Sanga's ceremony said gleefully: "I am happy because with biogas, cooking gets very easy"
The project is for five years during which training of masons and supervisors will take place. Training started in 2009 and the objective is to construct at least 4,000 biogas plants throughout the country but to start with, 200 plants will be built in the ELCT South Western Diocese, Meru and Morogoro Dioceses this year. The project will ultimately cover all the 20 dioceses of ELCT. 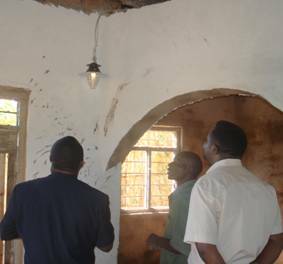 Fifty-eight masons from the three dioceses were trained in Tanga Region at the Buhuri Livestock Training Institute (LITI) and at Vocational Education Training Authority (VETA) centre also in Tanga. The dioceses are South Western - 20 masons; Morogoro - 10 masons and Meru - 18. Training is also done for Technical and Livestock Assistants who receive motor-cycles to facilitate smooth movements within the project area. Each trainee mason is required to construct two biogas plants as part of his or her training and given certificate at successful completion of the task. He or she is, therefore, given the task to look for willing customers and the first two customers are each given a subsidy of Sh. 500,000 towards the plant construction cost. Under the project, the certified biogas masons will be assisted to form their own enterprise in their respective regions. The estimated demand in Tanzania for biogas is at 100,000 installations in high potential Northern Highlands, Southern Highlands and the Lake Zone areas. A biogas digester converts animal dung materials into a combustible gas. The biogas plants built under the project are of the fixed dome type, made of masonry and concrete. The plants are installed underground in the yards of families and their operation consists of feeding of mixture of dung, urine or water daily. This takes about 20 minutes daily. Priority for the biogas installation, according to Mwaikenda, is given to farmers under the ELCT Dairy project. However anyone willing to have a biogas plant will be reached. On average, farmers with at least two cows or seven pigs, or a flock of 170 poultry, can generate sufficient gas to meet daily basic cooking and lighting needs of a household. Different plant sizes are constructed to allow for the biogas requirement of a family. Fixed dome type plants have a shelf life of over 20 years. Maintenance is restricted to occasional checking and repairs of gas pipes and appliances. publicity material for biogas campaign. © 2010 ELCT Image. 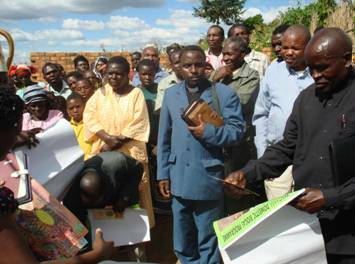 The project is run jointly between the Church and a government organ called Tanzania Domestic Biogas Program under CAMARTEC a centre for dissemination of technologies in the rural areas. It is gets financial and technical support from the Government of Netherlands. The ELCT Dairy Cattle project is carried out in all the 20 ELCT Dioceses in which many poor families have benefitted. The aim is to alleviate abject poverty found in the rural areas of Tanzania. Representing the Government, the Ward Executive Secretary for Matamba, Mr. Benedict Mwegeni, said biogas usage in the rural areas gives hope and has transformed life in the rural areas by providing lighting and cooking fuel as well as reducing deforestation. "It has given more hope to women in the villages," he said. Dr. Ernest Mukongo, the Acting District Agriculture and Livestock Development Officer in Makete commended and thanked the Church for bringing development close to the people. It is a project with far reaching and multi-pronged impact he said. The biogas project is a modest contribution by the Church in paving the way to curb deforestation, environment degradation and poverty alleviation in the country.